Human Wak-A-Mole For kids, larger-than-life experiences are the name of the game. If you want your party to leave a lasting impression, rent this game for your guests for them to play countless times, and make it life-size with the About to Bounce Human Wak-A-Mole Game. The About to Bounce Wak-A-Mole Game can handle up to 7 people, and simulate a childs favorite arcade game where your guests are the actual players. This life-size Human Wak-A-Mole is 14’' x 14’ and 7 feet tall. Imagine the excitement when your guests hop in to the About to Bounce Human Wak-A-Mole and feel the excitement of being a real live Wak-A-Mole. 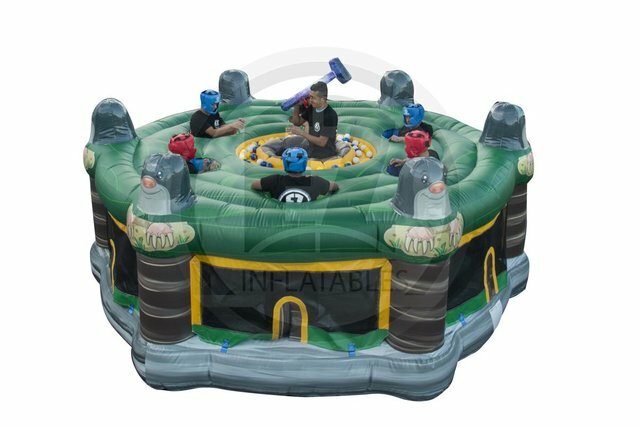 Priced at $299 for a five hour rental, this is a larger-than-life experience that’s perfect for any party or event that 7 people can play this Human Wak-A-Mole.